It doesn’t matter whether your ultimate goal is to make boatloads of cash, connect with customers, or provide insight into a topic you’re passionate about, blogging is hard work. Sure it seems like everyone has a blog nowadays, or has at least tried his or her hand at blogging at some point. But ask yourself, how many of those blogs have been abandoned, and for what reason? If you really want your blog to get noticed and flourish, you have to be willing to put in the long hours. Viral success won’t happen overnight in most cases. But just being willing to put in the work doesn’t guarantee you success on the Internet; after all, the online world is an unforgiving and fickle place. 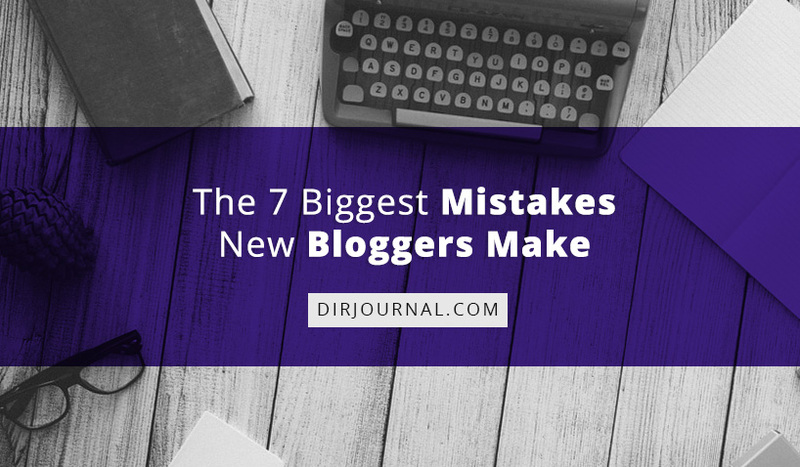 We know that you’re excited at the prospect of sitting down in front of your computer and hammering away on your keyboard, but before you do, read on to uncover the 7 biggest mistakes new bloggers make, so you can make sure you avoid them. Talking about Pokemon Go seems like a surefire way to get people to give your blog a shot. After all, the popular game has an insane amount of daily users ranging from casual players to feverishly obsessive. There’s a good chance that you’d see a spike in traffic if you were to start writing quality posts about those cute little monsters. This is all well and good if you too are a massive Pokemon fan, but if you’re not, steer clear. If you’re writing about something you don’t particularly care about, you’ll eventually grow tired of writing about it. If you don’t, it’s almost guaranteed that your writing will dip in quality, something your readers will pick up on (and pick apart). Do yourself a favor, only write about stuff you actually care about. When you first start blogging you have a million ideas and you are excited to get them all out there on the Web. It’s easy to hit that big PUBLISH button. It feels good. You’re inspired to write more and more and pretty soon you’re saying, “I can easily do this everyday!” No you can’t. Without a realistic schedule, you’re bound to slow down, get lazy, be overwhelmed with other obligations, etc. This can lead to what is often the death knell for many blogs, inconsistent posting. Your audience craves predictability. If you neglect your blog for weeks or months at a time, you can be sure you won’t have much of an audience when you finally decide to return. Be honest with yourself and start conservatively. Space out your posts and use an editorial calendar like CoSchedule to plan your posts in advance. Your competition is a mouse click away, so you better make sure that whatever it is your blog is doing, it is unique and insightful. Many people will say that content is king when it comes to blogging, but if you’re simply rehashing what someone else had already said there isn’t much value in what you’re saying. You have to think of your blog like a commodity. Make your readers pay attention to you by giving them a viewpoint or insight that is valuable. Now, I know I just said that content is king, but content alone isn’t necessarily going to drive the masses to your blog. Creating quality content is important in building a repeat audience, but in order to capture their attention, shameless self-promotion can be more valuable. Nobody truly understands how Google’s ranking algorithm works, but one thing is for sure, getting links from the authorities in your niche will help drive up your rank, so make sure you link to bigger sites and build relationships with established bloggers. In addition, make sure that your site has social media integration, you know, those little buttons that allow people to share things on Facebook, Pinterest, Instagram, Twitter, etc. No one is going to take the time to copy and paste your blog post’s web address and paste it into his or her social media platform of choice. No one. Except maybe your mom. Were you not paying attention o what I said up there in #2? Simply put you have to plan your content. It’s easy in the beginning to post everyday, but you will hit a wall. Or, worst-case scenario, you still post every single day, but it’s filler. The Internet has enabled people to connect with a far greater number of people than ever before, and that’s great, but it also means that there are millions of blogs out there, just like yours. If you’re not offering your readers quality stuff they will jump ship. The Internet has allowed people to be incredible fickle. You have to command their attention and entice them to come back for more. You won’t be accomplishing either of those things if you don’t have anything of substance to say. Google craves in-depth content, so make sure your posts are insightful. That being said, people surfing the web tend to have shorter attention spans than say, someone reading a novel. So while writing 1,000+ word posts is recommended, having giant blocks of text intimidating your readers from their computer screens is not. Break up long bits of text by adding large images, bold sub-headings and please break up your word vomit into paragraphs! All of these techniques help to break up larger posts, making them easier on the eye and more approachable. I said it right at the beginning of this article, but blogging is hard work. It takes dedication as well as a level of Internet wizardry that most people never even attempt to master. Building an audience will take excellent writing skills, a deep understanding of your topic and time. Do not be discouraged by low page views or subscriptions that don’t seem to include anyone outside of your immediate family. The average blogger gives up after 100 days. This is way too early. Be tenacious. If you can avoid these 7 common mistakes, you’ll be well on your way to starting a blog you can truly be proud of.